EMINESCU, Mihai. 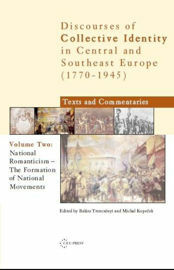 Political articles In : National Romanticism: The Formation of National Movements : Discourses of Collective Identity in Central and Southeast Europe 1770–1945, volume II [en ligne]. Budapest : Central European University Press, 2007 (généré le 26 avril 2019). Disponible sur Internet : <http://books.openedition.org/ceup/2308?nomobile=1>. ISBN : 9786155211249. Eminescu, Mihai. “Political articles”. Trencsényi, Balázs, et Michal Kopecek. National Romanticism: The Formation of National Movements : Discourses of Collective Identity in Central and Southeast Europe 1770–1945, volume II. Budapest : Central European University Press, 2007. (pp. 194-202) Web. <http://books.openedition.org/ceup/2308?nomobile=1>.